Why did Apple decide to go through Microsoft Store instead of continuing to distribute the bloated app? Apparently, the Microsoft Store offers enough benefits to make the switch (and the expense of supporting two different iTunes editions) worth it. Historically, Windows users could download and install almost anything from just about any Web site. With all editions of Windows 10, Microsoft is beginning to push developers towards a more centralized approach to application management. Windows 8 has introduced Metro, while Windows 10 brought true UWP support to multiple platforms. Desktop versions of Windows 10 continued having the ability to install apps from arbitrary sources. A special Windows edition named Windows 10 S was released back in 2017 for low-end laptops and convertibles. The “S” edition is restricted to running applications obtained directly from the Microsoft Store. This restriction makes for safer and faster usage experience while requiring significantly less maintenance compared to standard Windows editions. While users of non-S Windows editions can still download and install apps from arbitrary sources, the Microsoft Store experience offers centralized app installation and management. Below are just a few benefits of the Microsoft Store version of iTunes over the stand-alone edition. 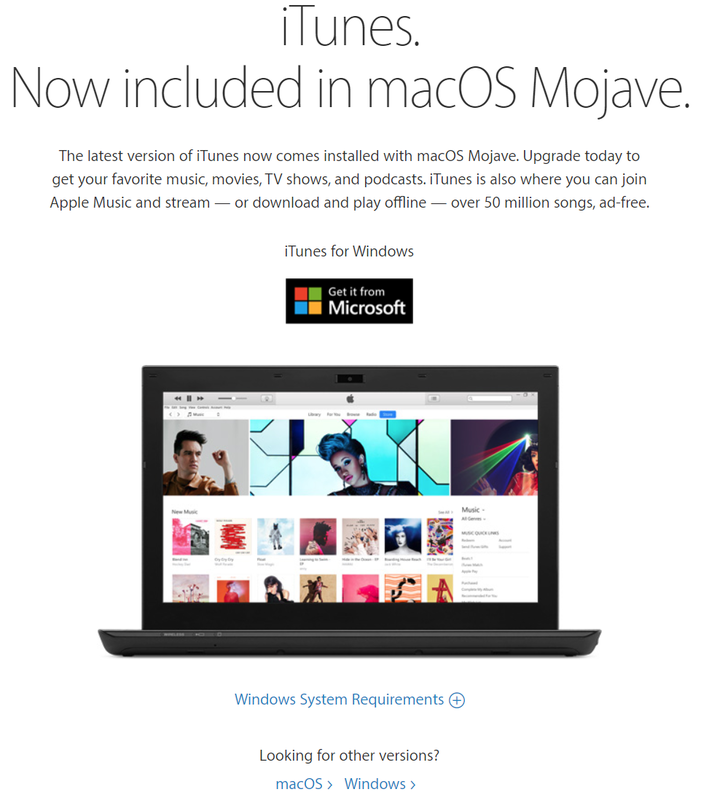 Through the Microsoft Store, Windows 10 users can easily push iTunes to all computers on their Microsoft account. The installation is seamless and unattended, and does not require clicking through the setup wizard or agreeing with whatever agreements. Speaking of installation speed, the Microsoft Store version of iTunes is significantly faster to install compared to the stand-alone edition. On my computer, it takes stand-alone iTunes about 2.5-3 minutes to install (and requires a system reboot to finish), while the Windows Store version installs in under 20 seconds (and does NOT require a system reboot). Installing the stand-alone edition of iTunes might be reasonably straightforward; it is the uninstallation process that could be a real trouble. For many users, the uninstaller just worked (followed by an obligatory system reboot); others had to individually remove iTunes, Bonjour, Apple Application Support in both its 32 and 64-bit versions, and Apple Software Update. Since Microsoft has set stringent requirements for apps utilizing Project Centennial, the uninstallation process for the Microsoft Store edition of iTunes takes exactly three seconds. The obligatory system reboot? Never heard of it. 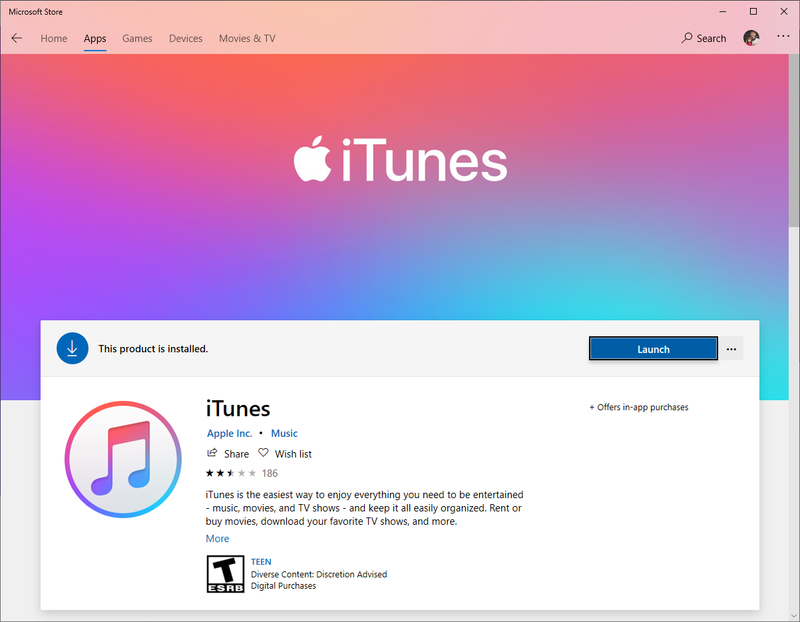 While the iTunes app is offering similar functionality to the previously available desktop version, the updates are now handled by and delivered through the Microsoft Store. Apple Software Update, the always-running background service, is no longer required to handle updates. As a result, users will no longer have to reboot their computers after updating iTunes. The Microsoft Store edition of iTunes includes none of the resource-intensive bloatware such as Apple Software Update, Bonjour, Apple Application Support, and possibly other helper background services. While it’s entertaining to see every major software vendor to build its very own system service just for handling software updates, seeing this service run constantly in background is much less fun. No more Apple Software Update running constantly in background. (On a side note, I wish Adobe would bring Creative Suite to Microsoft Store). Installing the iTunes app is one thing, while connecting to an actual Apple device is another. 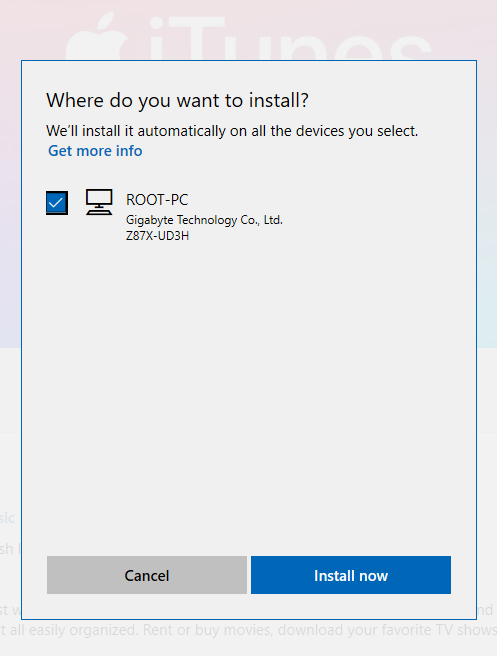 Once you launch the Windows Store version of iTunes and connect an Apple device for the first time, the required driver package will be downloaded and installed through Windows Update – again, no reboot required. The Microsoft Store version of the iTunes app follows a different path convention compared to the stand-alone edition. As a result, local backups made with this version of iTunes are stored on the users’ computers in a very different place compared to the stand-alone edition. Starting with version 4.30, Elcomsoft Phone Viewer fully supports the Microsoft Store edition of Apple iTunes. 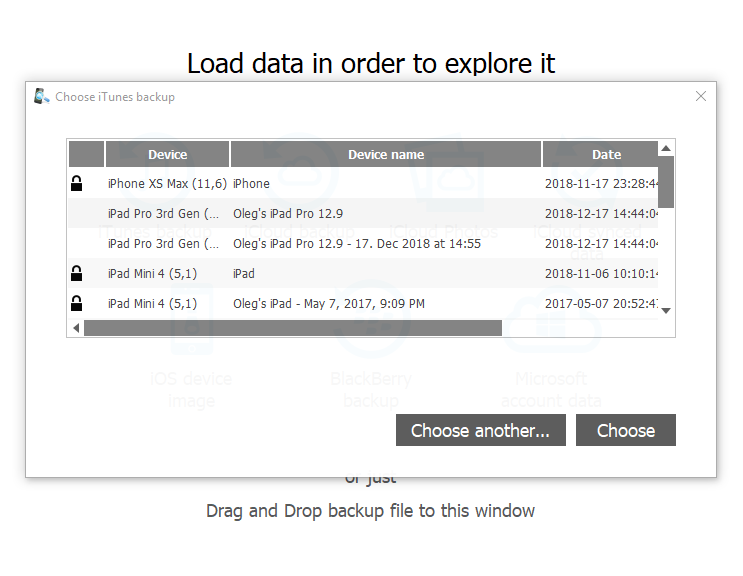 Elcomsoft Phone Viewer can automatically detect the location of local iOS backups produced by both stand-alone and Windows Store editions of iTunes. Interestingly, Elcomsoft Phone Viewer listed a significantly larger number of backups compared to the new iTunes app. Apparently, these backups were created by the old (stand-alone) edition of iTunes. Probably due to the different paths, some older backups did not appear in the Windows Store version of iTunes. We applaud Apple for bringing iTunes to the Microsoft Store. The Microsoft Store is miles ahead in installation and uninstallation speed, and delivers seamless deployment and background updates without requiring the users to reboot their computers. Since the Windows Store edition of iTunes is now the default edition, we expect its installation base to grow quickly among Windows 10 users. Our job is to ensure that ElcomSoft tools support both versions of iTunes on all supported platforms.